Color selection from a wide range of palettes. Color selection from a palette of H vs S and V selectors. Direct input of HSV or RGB values. In most cases, you will want to use the static method KColorDialog::getColor(). This pops up the dialog (with an initial selection provided by you), lets the user choose a color, and returns. The color dialog is really a collection of several widgets which can you can also use separately: the quadratic plane in the top left of the dialog is a KXYSelector. Right next to it is a KHSSelector for choosing hue/saturation. On the right side of the dialog you see a KPaletteTable showing up to 40 colors with a combo box which offers several predefined palettes or a palette configured by the user. The small field showing the currently selected color is a KColorPatch. Definition at line 377 of file kcolordialog.h. 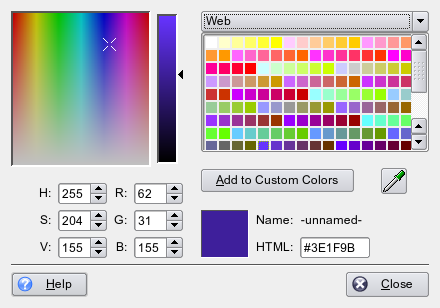 Constructs a color selection dialog. Definition at line 939 of file kcolordialog.cpp. Destroys the color selection dialog. Definition at line 1178 of file kcolordialog.cpp. Definition at line 1281 of file kcolordialog.cpp. Emitted when a color is selected. Connect to this to monitor the color as it as selected if you are not running modal. Definition at line 1237 of file kcolordialog.cpp. Definition at line 1188 of file kcolordialog.cpp. Creates a modal color dialog, lets the user choose a color, and returns when the dialog is closed. The selected color is returned in the argument theColor. This version takes a defaultColor argument, which sets the color selected by the "default color" checkbox. When this checkbox is checked, the invalid color (QColor()) is returned into theColor. Definition at line 1316 of file kcolordialog.cpp. Creates a modal color dialog, let the user choose a color, and returns when the dialog is closed. Definition at line 1298 of file kcolordialog.cpp. Gets the color from the pixel at point p on the screen. Definition at line 1533 of file kcolordialog.cpp. Maps some keys to the actions buttons. F1 is mapped to the Help button if present and Escape to the Cancel or Close if present. The button action event is animated. Definition at line 1542 of file kcolordialog.cpp. Definition at line 1515 of file kcolordialog.cpp. Definition at line 1290 of file kcolordialog.cpp. Call this to make the dialog show a "Default Color" checkbox. If this checkbox is selected, the dialog will return an "invalid" color (QColor()). This can be used to mean "the default text color", for instance, the one with the KDE text color on screen, but black when printing. Definition at line 1207 of file kcolordialog.cpp. Definition at line 1611 of file kcolordialog.cpp.